Containers made of Impruneta clay are prized above all others in the world. Durable, robust, frost-proof to -30°F and ruggedly beautiful, this is the clay used by the finest terra cotta craftsmen in Italy to express their artistic talents. Softer in feel and quicker to develop a flattering "patina", Umbrian clay is traditionally used to produce beautiful, classic Renaissance shapes and styles such as urns and containers for lemon trees. These pots are frost-proof to -20°F. Similar in color to Impruneta clay, but with a finer grain and smoother texture, pots from this region are somewhat easier to produce, which keeps the cost lower. Siena pots are frost-proof to -10°F and will age beautifully for many years. 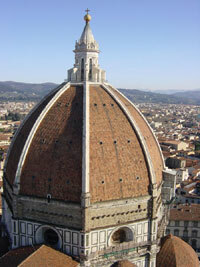 Filippo Brunelleschi demanded that the roof tiles of Santa Maria del Fiore (the Duomo) in Florence be made of Impruneta clay in 1503. Five hundred years later they are still in place and as beautiful as ever. How is this possible? While pieces made from the rugged, red-colored clay of Impruneta are the epitome of Italian terra cotta, all hand-made Italian terra cotta is made to last a lifetime. 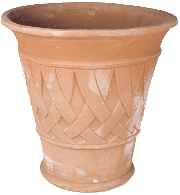 Unlike mass-produced or machine made products from other countries, Italian terra cotta is made from the robust clay indigenous to northern Italy and is kiln fired at approximately 2000°F for five to seven days. This slow, "high firing" ensures that the clay is fully fused, resulting in a legendary product. These traditional methods create high quality terra cotta that is durable, frost and salt resistant, and can last a lifetime. These beautiful terra cotta pots are individual works of art. The stylistic variations in each piece are the result of each artist's temperament and personality; in addition, the unmistakable fingerprints visible on some pieces and, in some cases, a wavering edge, demonstrates that each piece is hand made and utterly unique. The materials, methods and craftsmanship used by northern Italian artisans for hundreds of years has resulted in some of the most beautiful urns, vases and containers in the history of garden design. To learn more about the unique characteristics of products from varying regions download our article on "Clays & Soils". Or to explore the durability and value of Italian terra cotta download our article on "Why Buy Italian Terra Cotta"
Discover the age-old process that makes Italian terra cotta best. Click below to download more information. "The true finish is the work of time, and the use to which a thing is put. The elements are still polishing the pyramids."